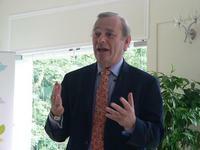 Jeremy Torr caught up with Sir Gordon Conway, a Distinguished Visitor Lecturer with the Foreign & Commonwealth Office in Singapore where he also graced the launch of the Royal Geographical Society – Institute of British Geographers (IBG) Singapore Branch. "Africa's cereal yield is stagnant while China's increases sharply," Conway. When you ask Gordon Conway what it is that impresses him most about how China is approaching its rapidly expanding food demands, it’s not what you might think. Forget that they have scores of scientists gene-splicing the perfect rice, or the largest and most ambitious irrigation systems in the world. What impresses him is that ordinary Chinese farmers are willing to try anything. As Chief Scientific Adviser at Britain’s Department for International Development (DFID) and president of the Royal Geographical Society, Sir Gordon has a lifelong interest in seeing nations grow enough food to sustain themselves. The agricultural ecologist and author of ‘The Doubly Green Revolution: Food for all in the 21st century’ is passionate about the need to enable all people to grow enough food to live on. “And I know from experience that we are only going to make significant progress reducing poverty, hunger and disease if natural and social scientists work closely together," he says. And if the world is to maintain the ability to feed itself – something thrown into the spotlight by mid-West US floods, biofuel crop subsidies, a general move from rural to city dwelling and decline in agricultural investments – we need to get better at looking at different ways of growing food, he says. 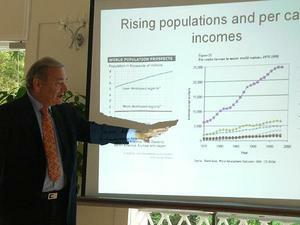 Rising populations with reduced food producion means starvation. “In parts of Africa, where people are using the same methods as they have for years, they can get maybe 1 tonne per hectare as an average yield. Using simple methods like human powered irrigation, growing natural pesticides and herbicides in with the crop, and not burning back harvested stubble, I have seen yields of 16 times that,” he says. He also told us of markets in Africa where grain farmers who were standing round chatting would suddenly jump into action, load trucks with produce and roar off for no apparent reason. Which is a lesson those farmers in Shanxi can ably teach us, notes Sir Gordon. “It’s not just a case of using more fertilizer or the latest hybrid genetically-modified (GM) crops. It’s about giving farmers the best solution to their problems, whether that is pest control, improving water supply or better access to markets. If we can do all these, then people have the option to try other things, like those carnations and walnuts, which take them away from subsistence. That’s what we really need if we are to feed the world,” he adds. Professor Sir Gordon Conway began his career in the 1960s as the chief entomologist for Sabah, Borneo. “I was brought in because the cocoa growers were facing severe problems with pest damage,” he says. “So I told them to stop using so much pesticide, which they did. I think that helped,” he smiles. Sir Gordon describes the six years he spent in Borneo as some of the best he had anywhere, but nonetheless he has applied his expertise on a global basis, living and working in Malaysia, Thailand, India, Lebanon and Egypt working on a range of agricultural and developmental issues. He has also been professor of Environmental Technology at Imperial College in London (1970-86), worked for the Ford Foundation in New Delhi (1988-92), and was elected as president of The Rockefeller Foundation in 1998.